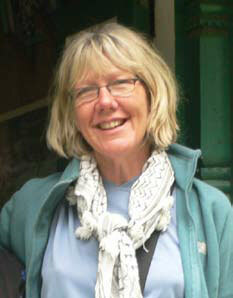 Last Trek Report – Muktinath, November 2010 - Trekking in Nepal with Teresa, Slow Trekking for peoples of all ages. Elizabeth from Coochiemudlo Island (off Brisbane, Qld, in case you didn’t know) came in five days early. She spent some of her time orienting herself to Isabel Armer’s work at the Bright Future Community Centre with plans to help out there after trekking. Elizabeth unfortunately arrived a bit run down but a couple of visits to the famous Fatima’s Healing Centre and she was soon feeling better. 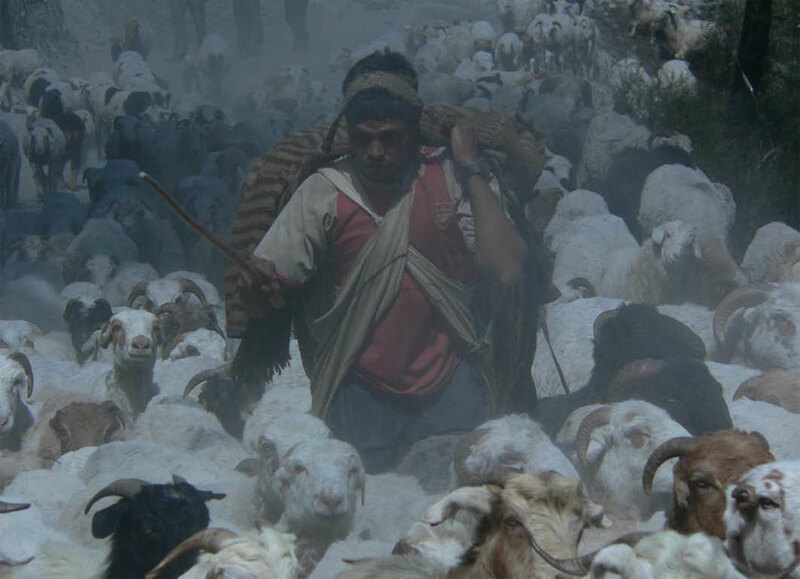 Fatima is a Uighur Chinese traditional doctor who has helped quite a few folks I know, including Sue on the last trek. I had a massage there one day, just for fun, and felt grand afterwards. Carol from Geelong and Helen from Elliminyt arrived two days early but a 10.50 pm arrival time meant that they didn’t get to see much of their first day. Culture-shocked and still a bit jet-lagged in the morning, we didn’t try to do too much. The Muna Cottage guesthouse is a pretty place to take breakfast slowly in the garden. We strolled slowly (it was quite warm and sunny) up to Kopan gomba. Luckily, a monk was giving a talk on the basics of Tibetan Buddhism so we pulled down a cushion and sat quietly in the back of the Gomba for a while. We took the short cut back down to Faica and soon had a minibus organised for a trip out to Pharping to visit my friend Jules. The traffic was horrendous and we got a puncture right in the middle of Chahabil. While Elizabeth and I policed the traffic around our van the resourceful driver soon changed the wheel. When we finally arrived, Pharping was lovely and Jules’ new house is a tastefully-decorated and cosy place. Today saw a flurry of arrivals. Dorje took the three women who’d arrived early out to Nagarkot for a day walk down to Changu Narayan. Ken from the UK arrived late morning via Mumbai (poor thing) and there was barely enough time to take him back to the Shambala and retrace my steps to the airport for Howard (Ken’s son, currently ex- Sydney) and Richard and Wendy (Beaumaris) all arriving on Thai (very considerate of them). So with seven customers and me making eight we were ready to start our holiday. Ken’s other son Gareth will arrive on 9 November and will join us at Tukche with any luck. I rounded up today’s arrivals for a walk over to Bouda for dinner and a few laps of the amazing stupa. We were in the middle of the Hindu festival season of Dashain, Diwali, Bhaitika, etc. but the full moon was a significant date on the Buddhist calendar as well. Buddhism grew out of the Hindu tradition (Siddhartha was a Hindu prince) and since both religions prosper side-by-side in Nepal there is a fair bit of cultural overlap. An endless flow of chanting, laughing, chatting people swirled around the stupa. 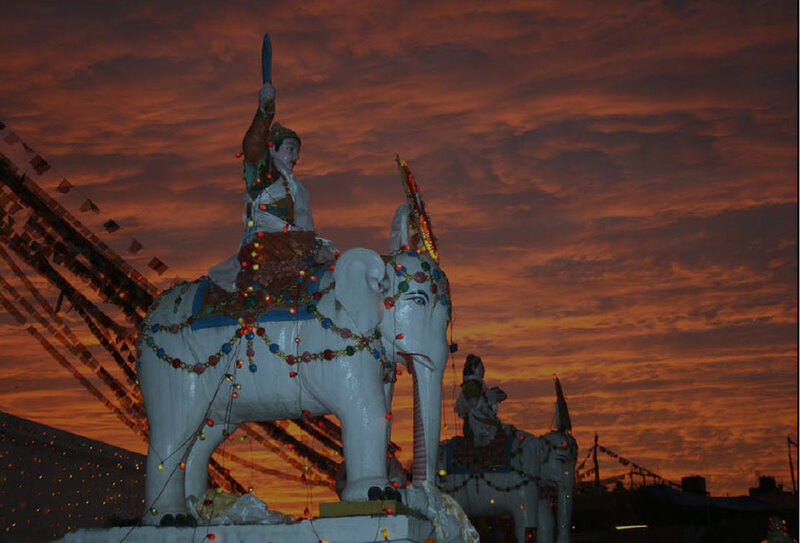 There was a stunning ‘salmon sky’ and coloured fairy lights and butter lamps adorned the stupa. Very crowded. Very festive. Loved it. 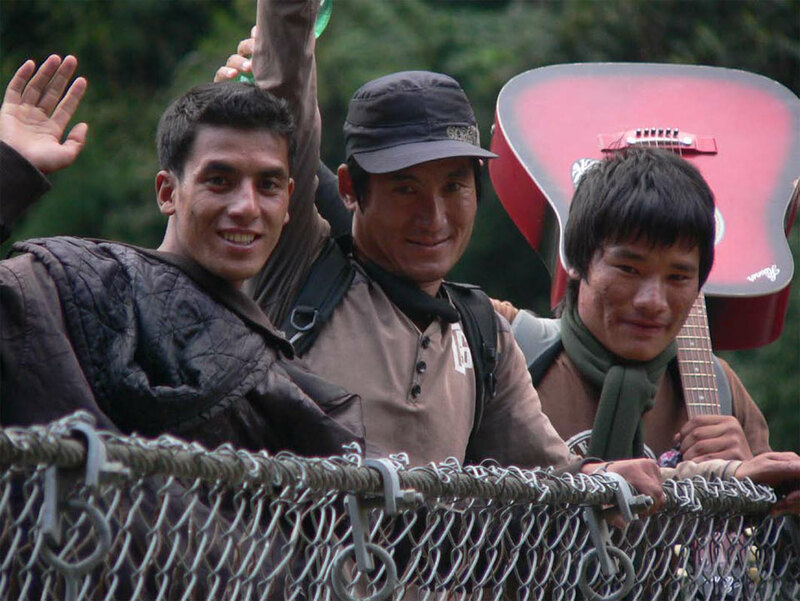 While eating at the Garden Café we were soon joined by Dorje and the day-trekkers. They had obviously had a blast of a day and were bubbling over with it over dinner. A good start I thought. There is no way that I’ve found so far to make the pre-trek day anything less than a bit fractured. Every individual needs different things from money changing to trekking gear. In and out of the Weizen all day we achieved most of what we wanted with a minimum of bother. There isn’t so much pressure on the Annapurna groups as we plan two nights in Pokhara before trekking. We got through all the necessary business with enough time to spare for a walk around the traditional bazaars. A pleasant change from tacky, tourist town Thamel. It was a warm and busy day as desperados on motorbikes were determined to push through the throngs of holiday shoppers. Oddly in Kathmandu, nobody gets really pissed off in these people jams. One just shuffles along sharing little jokes with your fellow-sufferers until the log-jam of people, rickshaws and bikes clears. We took refuge at a fabulous little lassi shop. It was new to me and I will definitely go back. 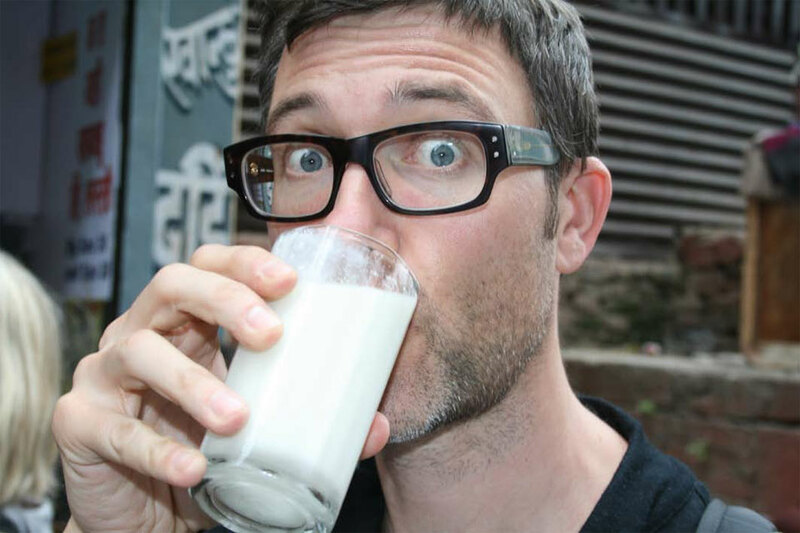 Simply the best lassi I have ever tasted – and I have had the famous Saffron lassi in Rajasthan. I think the secret ingredient was rosewater, but it was the finely shaved almond paste floating on top that made it sensational. This morning we headed over to the Greenline bus depot in Thamel for the big bus to Pokhara. We were fortunate to score an almost brand new bus which, strangely, appears to be an exact replica of the older ones. I can’t remember the last time we had such a dream run in the traffic. Hamlet for morning tea – on time. Riverside Resort for lunch – on time. Arriving in Pokhara before 3 pm, Lahar and Roden were there to meet us. A ride into Lakeside on the back of the motorbike was a real tonic after sitting in the bus most of the day. Showered and changed into our lightest clothes we gathered on the terrace for a drink. The mountains cleared around five for a dazzling pink finale to the day. Sanu laid on her best daal bhat and it was still warm outside at 7 pm. Some of us headed off to the Busy Bee after dinner and were not disappointed. This group really know how to party. Looking at Ken you wouldn’t think he was such seriously good mosh pit material. We cut loose. Nobody knows what time Howard got home but he did have to climb over the gate! Lahar, Bir and Dorje took all the guests out on the lake early this morning. It was very clear indeed until mid-morning so they had great views from the Peace Stupa. At around 300 metres the climb is a bit of a test, especially in these hot, humid conditions. Everyone survived so it looks as though we are all set for Nyapul tomorrow morning. A few last minute trips to the gear shops for pack covers, extra drink bottles, muesli bars, etc. We opted for an early night after trying to fit all the new ‘essentials’ into our packs – necessitating a fair bit of culling (who really needs deodorant on trek?). Maybe 6 pairs of socks are a bit excessive! Today saw us pile into our minibus at 7.30 for Nyapul. Scenery stunning. Conditions perfect. No problems en route, though we did stop for a bus with its front right wheel hanging over the edge of the road and its front left wheel almost following. Nobody was hurt so we kept going. We set off in ones and twos from the roadside with Lahar handling the formalities at the permit check post. 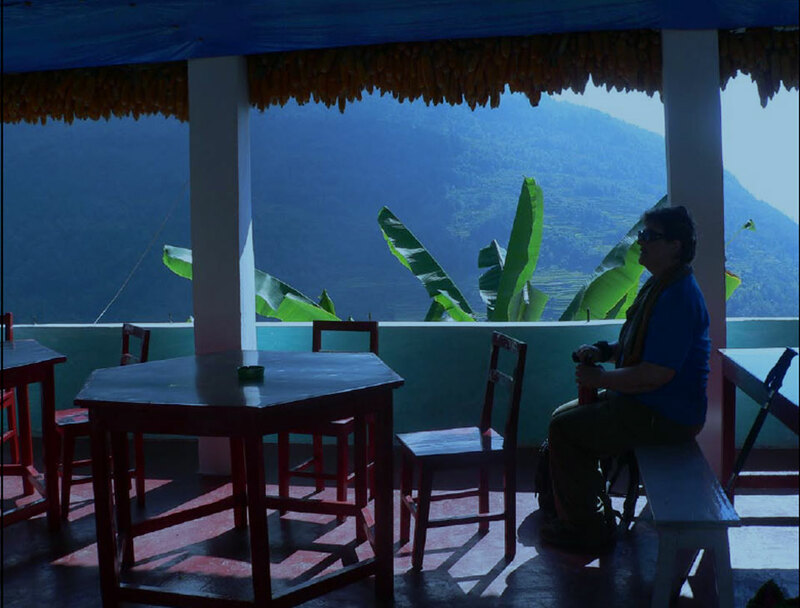 We regrouped at Birethanti for morning tea with Danish pastries bought fresh in Pokhara that morning. This lodge is a divine little place overlooking a gully full of rushing water and tropical jungle. The cicadas were screaming and it was definitely warming up. The first section of trail was a repaired landslip area but after a twenty minute climb it levelled out to a gentle up and down roll through farmland ripe with rice and millet in terraces above and below the trail. Haystacks were being raised everywhere and harvested fields were being ploughed under with oxdrawn ploughs not much changed since the Middle Ages. Being our first day it felt quite hard but we made Tikedungha by about 3.30. It is a very traditional old-style lodge. Tiny rooms, narrow beds and thin mattresses – most of us were too tired to care but Howard, who I’d suspected was a ‘bit weird’, went for a run up the Ulleri steps. Go figure? This is always a pretty hard day with any group and ours was no exception. There are over three thousand stone stairs and they seem to get steeper and steeper as the day wears on. Lunch was a relief. Elizabeth had started the day badly, feeling really sick with a dreadful cold. A few meds, a bit of encouragement and a determination not to be left behind saw her rally and ‘have a go’. She did look ‘all-in’ at lunchtime but hey, she made it. There were more stairs after a long lunch and, no, we were definitely not getting used to them. Banthanti hove into view before too long and everyone felt better after a shower and a rest. Despite the hot day there was very little heat in the ‘hot shower’. The Nepali idea of hot water is water that is not freezing cold. Buckets and bowls did the job. We spent a lovely evening eating and drinking, singing and dancing. The stove, made out of a 44- gallon drum cemented and mudded into the floor, was super efficient and soon the whole family joined us in the dining room. Another fun night. It was uphill again, of course, but not so steeply today. Within minutes we were in deep, deep shade beside a clear gushing stream. The trail criss-crosses the cataracts until an open meadow at Nangethanti for lunch in the sun. We all did the morning section without problems but as the day wore on some of us tired dramatically. As we neared 2800 metres the altitude becomes a bit of a factor. It was startling to arrive at Ghorepani to clear skies and glorious views. A first for me. Everything but Annapurna South was perfectly clear and even that cleared magnificently at the end of the day. It was awesome. The Sunny Lodge lived up to its reputation as a party lodge as first the Nepalis and then the Bideshi (us) hit the dance floor. The Nepalis were good but I like to think our Macarena was a bit of a hit. What a lovely, easy day this was – well, for those of us who didn’t climb Pun Hill this morning anyway. Wendy, Richard, Carol, Ken and Howard (Dad ’n’ Dave) awoke at 5.30 and Dorje, Min and Sunder took them up the 300 metre steep climb for what must be one of the world’s most beautiful vistas. 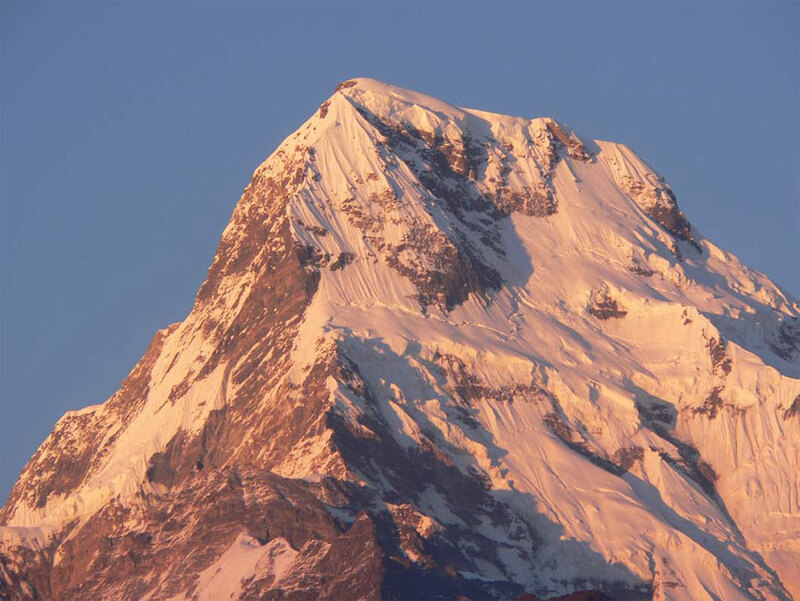 The morning was clear, thankfully, and they were not disappointed – from Machhapuchhare to Dhaulagiri, they were all on show. Mind you, the view from the dining room window over a cup of coffee was not bad either. We sauntered downhill to Sikha, not quite in time for lunch. We stopped by our old haunt, The Serendipity for a quick bite which turned out to be a very pleasant lunch break. Good food, friendly owners, pretty garden. The farms and villages through here are lovely in November. Everything is ripe in the fields and gardens and, as it’s the festival season, each village is garlanded with long ropes of fresh flowers. The garlands alternate whole marigolds, little bunches of leaves and poinsettia petals (possibly, they are not the petals but you will know what I mean). They look gorgeous and leave our tacky Christmas decorations for dead. There is always something going on beside the trail as the hard-won harvest is gathered and dried and threshed for the leaner months to come. Festival time brought the whole village to our doorstep tonight. The women all sang in high tenor voices while exquisitely beautiful little girls performed their traditional folk dances for us. The women here are very lovely, certainly not thin. All curves in fact. Their hand gestures, sweet smiles and flirty eyes held everyone transfixed. Another great night out. A fine day and a beautiful trek. More farms and villages and local people going about their work. It became hotter and hotter towards the bottom of the valley – back to 1100 metres. We soon heard the roar of the river as we walked through a tiny unspoilt village which led to an endless zigzag path descending into the bottom of the valley. The tailenders were in need of a little sustenance at 12.30 (the front-runners presumably eating lunch in Tatopani already). It was pretty slim pickings at the shabby hamlet of Ghar Khola. It was always a grotty little place and with the advent of the road bridge just 200 metres downstream it has been completely sidelined. Still, a dear old crone in a ‘black hole’ style kitchen produced some chick pea and veg curry for each of us that was actually delicious. 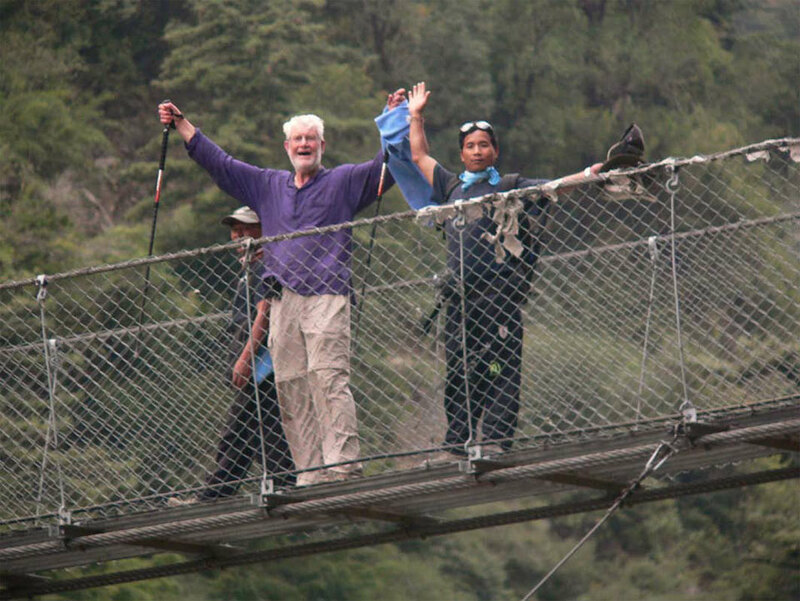 Sustained, we set off for Tatopani, stopping to tie Dorje’s prayer flags onto the big bridge over the Kali Gandaki. We walked along the new road into town. Not as picturesque as the walking track but what a relief to our poor knees to stop pounding downhill. Today is Tihar so I gave all the porters a new topi, the traditional gift. They were a bit of a hit as they all wore them out to the local tavern. We are having a rest day tomorrow so the boys can ‘cut loose’ a bit tonight. I really enjoyed our day off. I mean REALLY ENJOYED! I stayed in bed most of the morning having coffee and breakfast sent up. Heaven! Some of the crew did the early morning hot springs. I think Ken went fishing. After lunch, with all the washing hung out to dry, Ken, Howard, Carol, Wendy and Richard (are we seeing a trend here??) took off for a hike up to the nearby waterfall. They appear to have enjoyed it immensely. After a bit of shopping – this is the biggest village we have encountered so far – we had a beautiful dinner in the garden with a few beers. We actually kicked on till 10.30, unheard of on trek, and the waiter brought us a candle for the table as he needed to turn off the lights. It was a gentle, almost tropical night with crickets and cicadas for mood music. A really big day’s trekking today. We set off early to take advantage of the cool morning but we were soon trekking in full sun – it was hot. 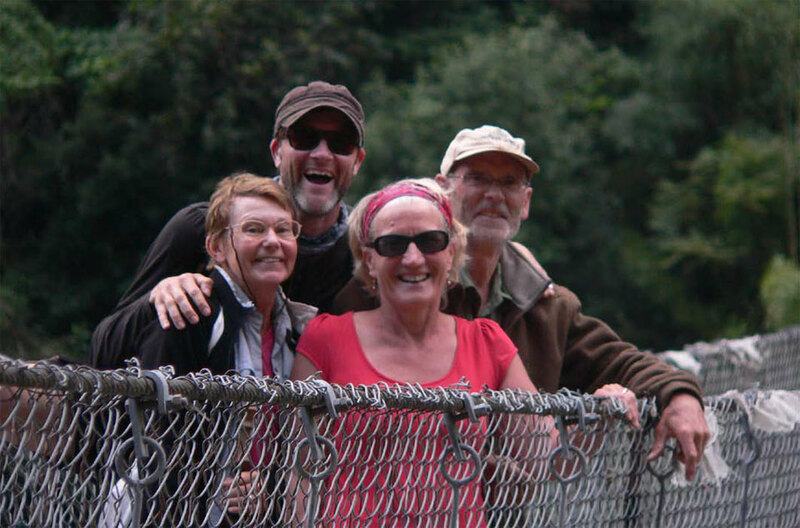 Richard, Wendy, Carol and Howard all opted for the harder trek on the east bank of the Kali Gandaki and left the road at the first bridge after Tatopani. The rest of us trekked on up the road till Dana where we walked through the old village of beautiful houses dating back to the days of the salt trade. 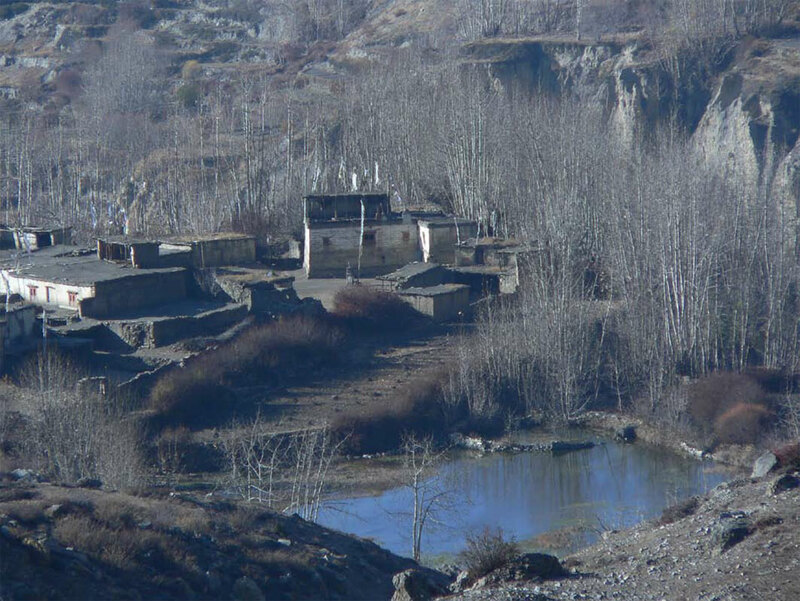 This trail was one of the major trade routes to Tibet and some of the houses are 300 years old. The A Team lunched under the big old apple tree at the Rupse Lodge. We spotted the B Team across the valley. After walking right below the massive waterfall at Rupse Chahara we soon found the rest of our crew waiting for their lunch at Kopchepani. This is another rather grotty little village but alternatives are a bit thin on the ground. Helen, Ken, Elizabeth and I set off up the big climb to Ghasa. I felt I was setting a pretty good pace but Helen stayed with me. Even the scary cliff edge trail didn’t faze her today. On ya Helen! Ken, who was full of a cold, took it a bit easier today but he and Elizabeth were only ever ten minutes adrift. 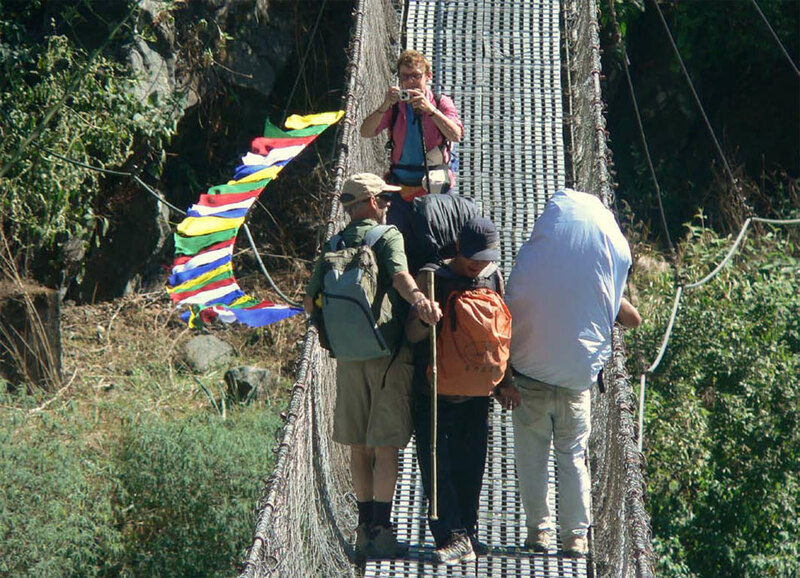 I was taking some good shots of people crossing the huge suspension bridge just short of Ghasa when the B team appeared in the viewfinder. Got some more good pics and we all trooped in around 4.30. A big day out. We’ve ordered Pumpkin Soup with Garlic Bread and Chicken Curry with Rice for dinner. Electric lights in all the rooms and everyone in good spirits if a tad tired. Netra rang me from Kathmandu. Gareth (son of Ken, brother of Howard) has arrived in Nepal and will fly to Pokhara tomorrow. The plan seems to be working. Breakfast was a bit slow in coming as there was a large contingent of Germans ahead of us. Their porters were, disappointingly, rather heavily loaded but their guide Thakur told me that the German customers were major supporters of three local schools. Good on them. The walk through the old village of Ghasa was interesting. Thank goodness the road was built around the outside of the long, winding trail through the whitewashed two and three-storey homes. Access from one floor to another is by a notched tree-trunk ladder. We found the caretaker of the tiny gomba in the upper village. About three metres square, it is built over the trail with a tunnel underneath with prayer wheels along the walls. Wendy took a lovely Nepali ‘Madonna and child’ photo while we waited for the key – a divine mite of three months called Jessmina (spelling my own). There is no way to avoid the road on today’s trek and the smell of diesel was most unwelcome but the views were splendid. 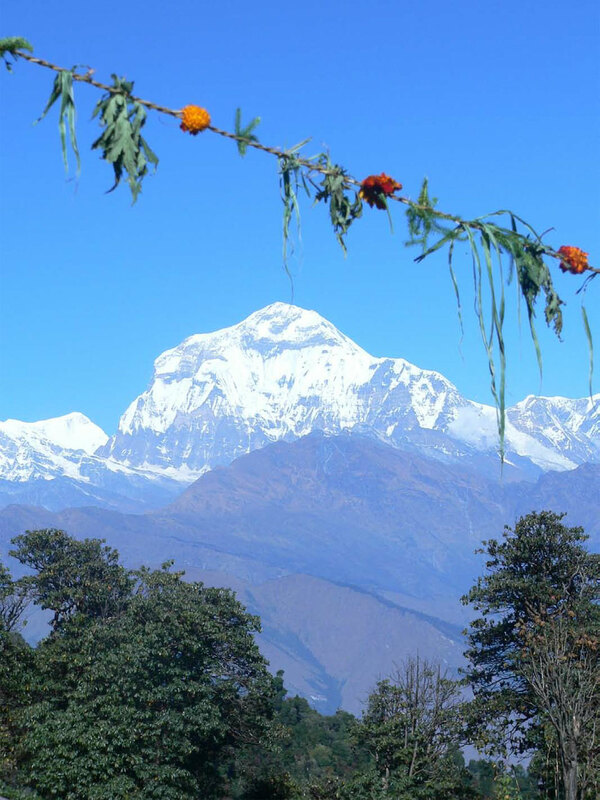 We could see up to Dhaulagiri and Tukche Peak ahead of us with the ice-fall in between. We could see down to the Lete Kola hundreds of metres below. As we neared Kalopani the forest had become entirely pine trees and the air soon cooled as clouds covered the sun. The rooms at the See You Lodge are almost unbelievable. Green fitted carpet, clean doonas and pillows on full-sized built-in beds and proper, fair-dinkum bathrooms. I know, it shouldn’t be all about the quality of the accommodation but these rooms are a real treat. 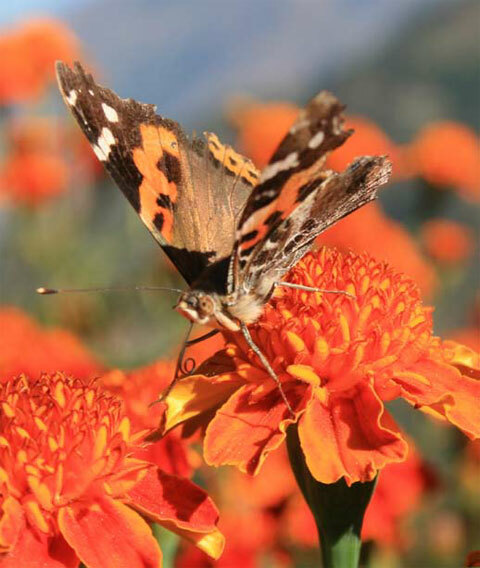 Netra rang this morning – Gareth got his flight to Pokhara. A spectacular sunrise lit up Dhaulagiri and Tukche Peak this morning and we were up on the roof at 6 am to see it. The Annapurnas played hide-andseek with the clouds but I don’t think anyone was disappointed. Breakfast was unhurried as we only planned to get as far as Tukche today. 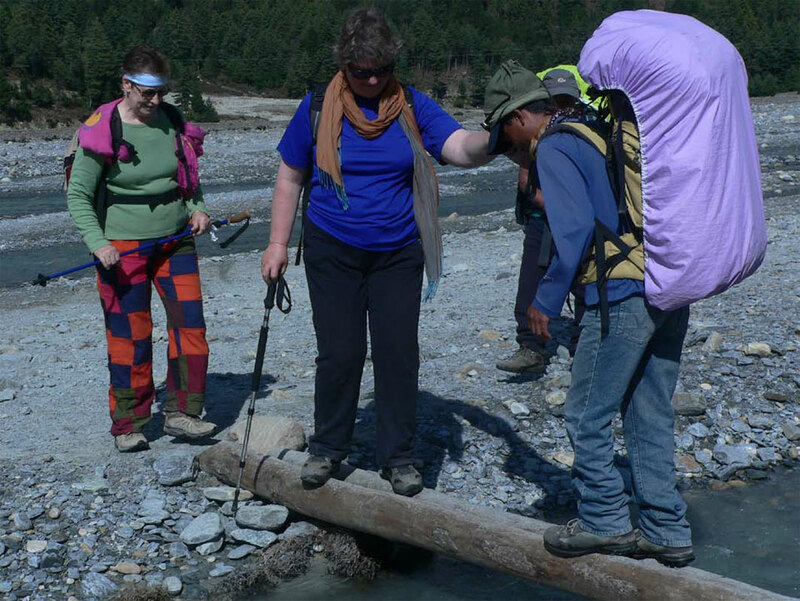 We would have liked to take the trekking trail on the east bank of the Kali Gandaki but unfortunately many of the seasonal bridges were out of action. We had a cuppa at Kokethanti and then took the main footbridge across to the road. This footbridge is on a magnificent bend in the river where the whole upper Kali Gandaki valley opens up. The river is braided across a flat river bed and the river rushes through many little streams with a multitude of interesting rocks, including fossils, scattered in between the water courses. We searched hard for potential fossils and found a few pieces of riverworn saligram. Howard found a big egg-shaped black rock which he is certain contains a fossil. (I’ve bet him 500 Nepali rupees that it’s a dud!). We were given a very good lunch at the Riverside Lodge in Larjung. Howard, as is his wont, sprinted up to a nearby temple on a hill. The architecture really changes here and you know you are entering a culturally different region. Chortens dot every hilltop, walls of prayer wheels line the street here and there. I would gladly spend a few days here in future and visit some of the surrounding gombas. The wind was at our backs as we set off for Tukche. The beautiful Tukche Guesthouse was as welcoming as ever – thanks Samar and Uma. Saila is growing up into a nice young man too. Gareth was already there with Tham. Well done and welcome. We took a spin around the village and checked out the distillery – the boiler is impressive though the brandy a bit less so. We checked out the largest gomba in the village but it was getting pretty nippy at the end of the day and we were soon tucked in around the hot table for dinner. With 11 French trekkers and 10 of us plus all the porters and guides I thought they did a great job in the kitchen. Pumpkin soup, veg curry with rice and stewed local apples for dessert. Not bad at all. I am so enamoured of my quirky little corner room in the old part of the house that I’ve started hatching a plan to return here one day soon for a whole week and explore the area more fully. 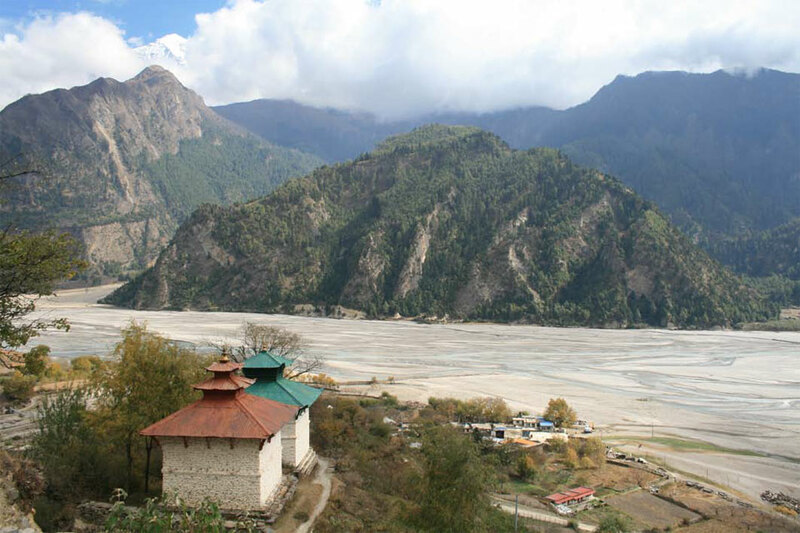 It is quite a long trek from Tukche to Jomsom, especially with the wind buffeting around after 11 am. We got away a bit late this morning – 8.20 – and after half an hour we crossed the big new suspension bridge and trekked the lovely sheltered trail on the east bank. 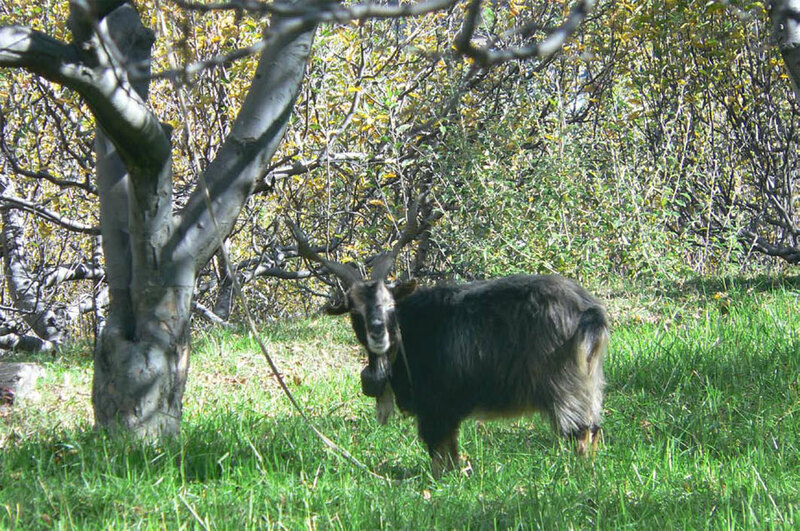 Walking through pine and juniper woods and then apple orchards to the Tibetan refugee camp at Chairo was especially attractive. We were lucky enough to get a look inside the old gomba. It is under restoration in a big way. The second chamber, containing a massive 500 year old Guru Rimpoche statue was amazing. The refugee camp here has become a permanent village over the past 50 years. Sadly, most of the Tibetans now realise that they will never go back to Tibet. We had a cup of tea and then ran the gauntlet of the trash traders. I did manage to find a couple of old things – a much worn bronze Tibetan calendar plaque and a tiny brass seal with a temple dog as the handle. Marpha with its surprising architecture was a relief from the wind. Whitewashed houses flank an extremely narrow paved lane as it winds through the village. The carved windows on the houses are very well-preserved and a quick trip to the gomba (rather flashy and mostly new) afforded a great view over the rooftops to see a maze of interconnected houses. It was ‘really bloody windy’ in the afternoon but gorgeous none-the-less. This country has been eroded by wind and snowmelt into a myriad of different shapes in every subtle shade of brown and ochre. The women dazzle as they pass by in glittering red shawls and headscarves. The grubby kids with liquid brown eyes are adorable and everyone shouts a friendly ‘Namaste’ into the wind. Well, everyone except the French trekkers of course. What is it with the French abroad; they are so nice at home. 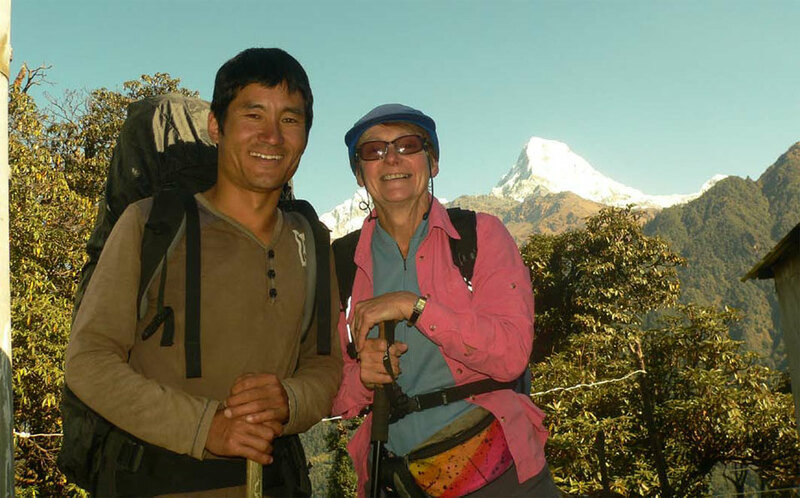 Carol, Gareth, Richard and Wendy crossed the river and came into Jomsom via Dungba Lake and Thini; they loved it. Howard, Helen and I took the steep trail up to Shyang and found Mangal’s auntie Sampyari at home with her little daughter. We first encountered little Ishneha as a new baby girl about 5 years ago. She is growing up fast but mum is struggling since the loss of her husband shortly after our first visit. I gave her a very small amount of money and she seemed really touched. It’s not about the money sometimes; it’s just seeing that someone else cares a little. I hope we can help her in the future. The road was under repair between Shyang and Jomsom so we were diverted to the riverside trail. The construction digger was sending cascades of boulders down onto our path but we managed to give the barrage of rocks a wide berth (just). We were almost blown into town and very pleased to be in comfortable digs at the Marco Polo. As I write this the wind has dropped completely. No jeeps, no motorbikes, and no wind – the silence is deafening. It was an easy walk to Kagbeni. 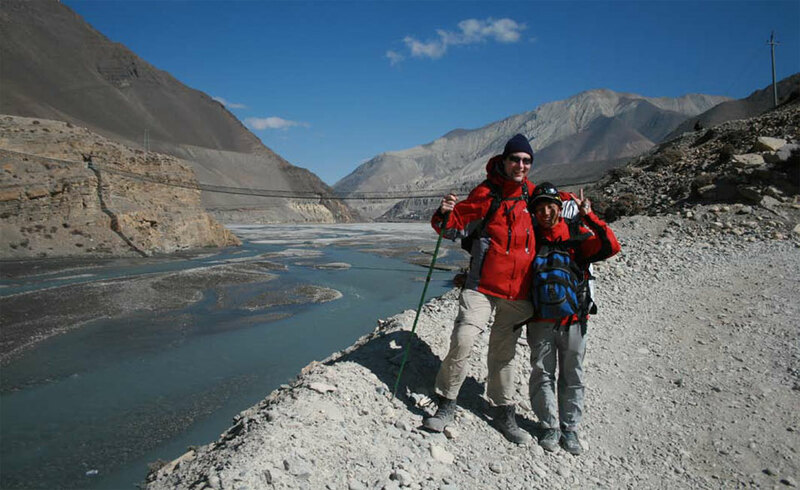 Almost entirely flat, the trail follows the stony riverbed of the Kali Gandaki. I particularly like the bleakness of the landscape on this section. There is a point at which you can no longer see Jomsom behind you with no sign of a settlement up ahead. The river is at least a kilometre wide and, once again, braided into multiple streams. The jeeps and motorbikes were a bit of a pain but they were mercifully infrequent. We bought some brilliant saligram fossils off a roadside stall. The old man who runs it lives an almost feral life in the middle of nowhere. I offered to bargain for Gareth but when the opening price was only 300 rupees ($4) I lost heart and Gareth paid quite happily. We walked out onto ‘Frank’s Bridge’ just for the hell of it. The windy conditions left us parched by the time we reached Eklai Bhatti where we consumed gallons of tea. Snugged out of the wind in the sunshine it was almost too hot! Forty-five minutes and a couple of steep ‘ups’ later we were in the Asia Lodge at Kagbeni. Big rooms with attached bathrooms and hot water – lovely! The entire group, minus yours truly, set off for Thiri in Upper Mustang at around 3.30. The trail seems to have deteriorated somewhat so Helen and Elizabeth hit reverse and took a walk around town instead, including the lovely old gomba. It was Ken’s birthday and the kitchen staff made a beautiful heart-shaped cake with candles. After a rousing chorus of ‘Happy Birthday’ Khaji led the singing. After a few traditional folk songs where Lahar led the dancing, we were soon all on the dance floor. A fun night and a birthday to remember for Ken. Happy Birthday mate! This morning broke rather grey and cold so we dressed really warmly for our horse-ride up to Muktinath. We needn’t have bothered. The clouds soon disappeared and, for once, it wasn’t even windy. The horses were all fairly well-behaved though there were a few sore bums and aching knees when we dismounted for morning tea at the Blue Sheep. They make a beautiful cup of tea with their own particular mixture of spices in the pot. The garden was full of very mature dope plants. We encouraged the porters to have a ride for a while after morning tea and stretched our own legs on the short walk up to Jharkot. Feeling the altitude a bit as we climbed well over 3,500 metres we were happy to have the ponies back for the final steep section. The horses dropped us at the Mona Lisa Lodge (where do they find these names??) where a super veg daal bhat was ready for us. Eating upstairs on the sunny veranda we took helping after helping of veg curry made with wild dried mushrooms. Feeling a bit over-stuffed we headed off up the hill to the temples after lunch. I love coming up here. The holy water spouts, the Hindu temple, the tiny gomba built over the flame and water in the rock – and the view back down the valley is unbelievable. Gareth, Dorje and Howard went up a bit higher to string up some prayer flags. 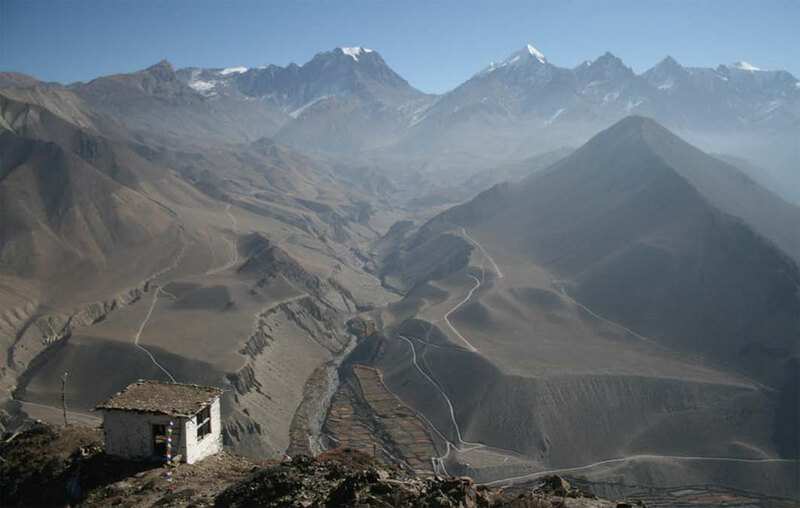 I think we all felt a sense of occasion – we had made it to Muktinath, all in good shape and good spirits. Well done people! I had decided to try staying down at Jharkot this season since Rani (bloody) Pawa is a bit of a dump. We had often taken lunch or a cuppa at the small family-run New Plaza lodge. It is quite rustic but clean in a simple way that I like very much. Far too cold to sit in the dining room at night, we all crowded into the kitchen. It was a big kitchen but had a cosy feel and it was a treat to watch our food being prepared. An even bigger treat to eat it. This guy can really cook. His apple pie and custard really set the standard. We had no reason to start early today. Howard and Dorje had already left. They wanted a flying start so that they could climb to the shrine on the hill behind Kagbeni. Dorje had the idea to put his prayer flags up as high as possible. It is a rather treacherous trail and I wasn’t that keen for them to do it but they are both grown men. The rest of us went for a stroll about Jharkot after breakfast. It is an ancient crumbling ruin of a place where people’s everyday lives haven’t altered much since the Middle Ages. The small monastery here is particularly beautiful with a sheltered courtyard in front of the gomba. The walk back down to Kagbeni was a breeze – well, actually it was a howling gale at times – apart from a brief cuppa at the Blue Sheep, we hardly stopped. It is great to see such mind-blowing scenery while strolling gently downhill on an easy track. This valley is beautiful beyond words and the sheer scale of it is hard to capture in photos. We did mosey about amongst the crumbling ruins this afternoon. The little museum at the Upper Mustang check post was quite interesting until the power went off. The gomba was, alas, deserted but for two vicious dogs on the roof. They clearly resented our presence. A well-spoken young man went off to find the Lama. In typical Nepali fashion, nothing more was seen or heard from either. I guessed a hot cuppa at the Red House and a glimpse of their lovely old family gomba, which is in the heart of the house, might be an interesting alternative. Whilst it was a lovely house to see I copped an earful from the owner’s wife. ‘Why don’t you ever bring your groups here to stay?’ ‘We are not just a museum you know!’ What could I say? Their renovated rooms do have attached bathrooms but they are so dark and gloomy compared with our light-filled rooms at the Asia Lodge. 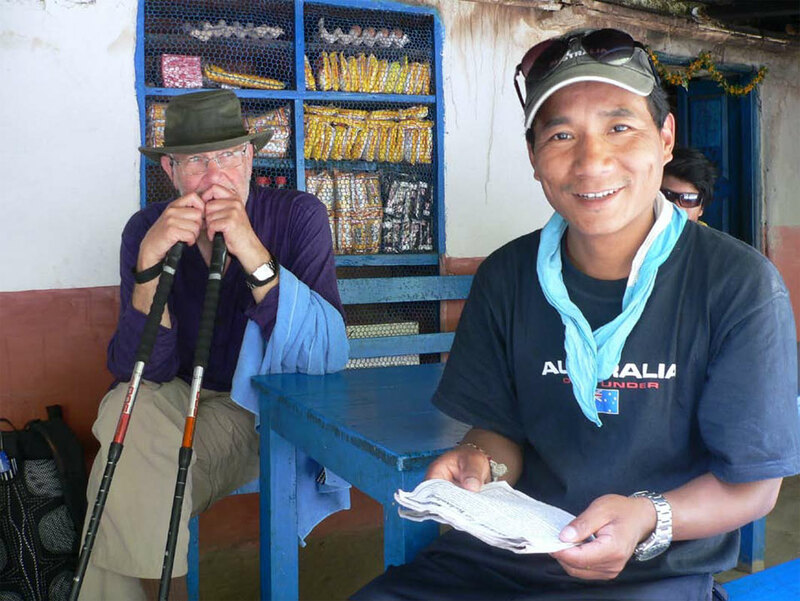 I tend towards lodges that treat our porters and guides with respect. Because of caste considerations (my pet hate) this doesn’t always happen. It was our last night with the porters and they asked us if they could sing for us. Yes!! Howard had learned of a technique for cracking his potential fossil rock. Heat in hot coals, drop into cool water. It worked a treat and, wouldn’t you know it, contained a perfect saligram fossil. He donated the 500 rupee winnings to the boys for a bit of a drinks party in the kitchen. Howard had found a dusty bottle of red wine in one of the village shops. He had bought yak cheese and crackers to go with. We shared it around and sang and danced with our boys. A perfect farewell. We got off to a great start at 8 am. The boys hoped to make the midday bus back to Pokhara so we hardly stopped along the way. It is a flat, easy walk and we were in Jomsom by 11 am. Half an hour later (it’s a big, long town) we were all back in the Marco Polo, the boys were demolishing huge daal bhats while I made up the pays. There were definitely tears as we waived them off, though we knew we would see them all in Pokhara in a couple of days. I had a call in the evening to say they had made it all the way to Beni. They would most likely be in Pokhara before us. (They were!). That afternoon, in a howling grit-filled wind, we headed back down to Shyang. It only took an hour and Howard wanted to help Kabita’s mum Sampyari with a very generous donation. 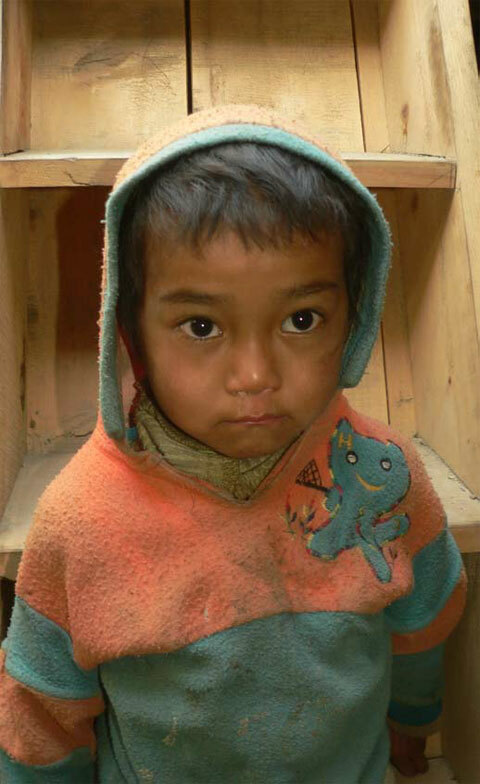 The money will be enough for little Ishneha to go to boarding school in Jomsom. Mum’s only condition was that Ishneha should not be taken away to Kathmandu like her sister Kabita. From Jomsom’s boarding school Ishneha can come home on weekends and her mum can visit whenever she wants to. Thanks Howard. It will be a good day in the future when your daughter Indigo and Ishneha finally meet each other. The walk back, with the wind at our backs, was a lot easier. Our last dinner on trek was a rather quiet affair. We all felt that something good was about to end. 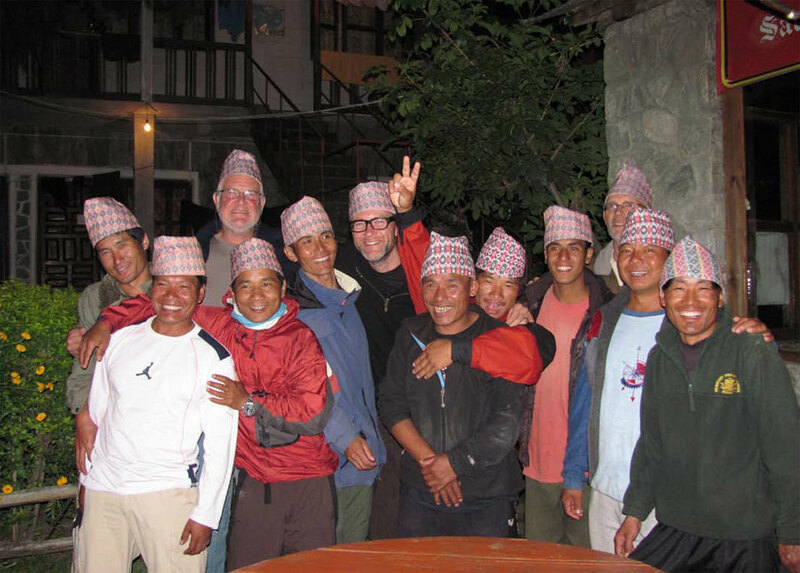 Most of our clients get along with each other on trek but some groups really bond into a mutually-supportive team. This was such a group. Our flight was delayed by a couple of hours but eventually went off without a hitch. I did have a slight moment of consternation as we made a banking turn just after Ghorepani. In and out of cloud, I thought perhaps Pokhara airport had closed and we would have to return to Jomsom. Luckily, it was just a holding loop and we whizzed over the Peace Stupa and into Pokhara minutes later. Pokhara was soft and warm and green after the wilds of Mustang. We drank endless cups of tea and coffee on the sunny terrace of the Lake Diamond while we figured out what to do with all our filthy clothes. We shopped a little in the afternoon while Gareth, Howard and Carol (now known almost exclusively as Choto) hired bikes and rode out around the lake. Dinner at the Moondance was good but, having arisen before dawn, we didn’t want a late night out (well, most of us). I think some of the group partied on but I was oblivious. The day started with an early call for a taxi ride up to Sarangkot. 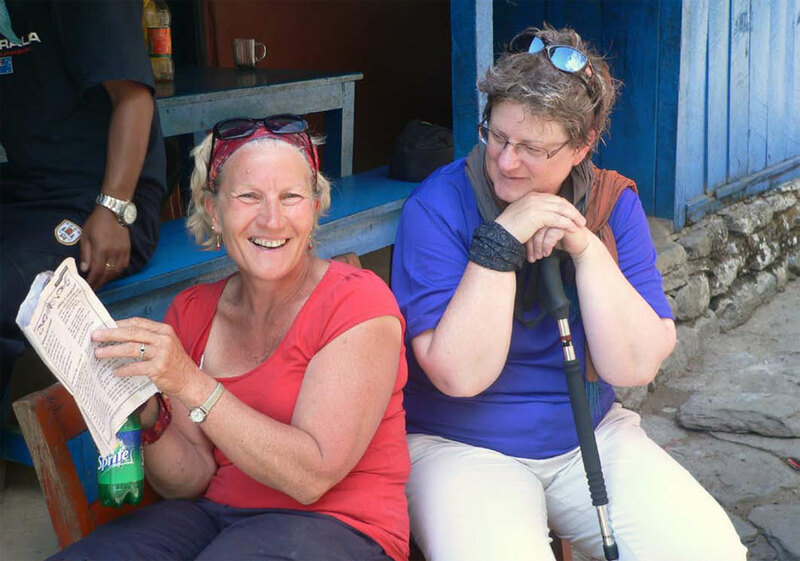 Myself, Helen and Elizabeth (who had injured her ankle at Jomsom on the last day of the trek) opted out. I think the walk was perhaps a tad harder than expected though some of the crew were nursing varying degrees of hangover which may not have helped. All returned safely for lunch and there was some pretty frenzied shopping in the afternoon. Myself, Helen and Elizabeth bought gorgeous bed covers, wall hangings and beautiful shawls from Dinesh’s shop. Wendy followed suit with a couple of lovely shawls. We ate with our boys at a wood-fired pizza place in the evening after a walk over to Lahar’s house. His wife and kids were a delight as ever. Khaji showed up to join us but had spent the day at the hospital with his new baby daughter who was running a severe temperature. His place was at home with his wife and baby so we soon sent him packing with fond farewells from Wendy and Richard. We turned in fairly early to face the tiresome task of fitting all our new purchases into our packs. That was a tough job. The bus journey began sadly with Lahar coming along to say goodbye. I so miss him when I am away. Purna showed up at the very last minute which was a special treat for Helen. The bus trip went like clockwork – again. No traffic jams, delays or problems. I could get used to this. The group dispersed at the Greenline depot. Since they had yet to see the old Durbar Square it was a good opportunity. Wendy and Richard took off to spend time with their Nepali friends and I took the bags on to Kopan. It was great to catch up with Isabel and Netra again. Everyone found their way back during the evening – a minor miracle – though I think Netra was consulted by phone for directions by Richard and Wendy’s friends. Dorje took Richard and Wendy off on a big cultural day out to Pathan Durbar Square and Bhaktapur. 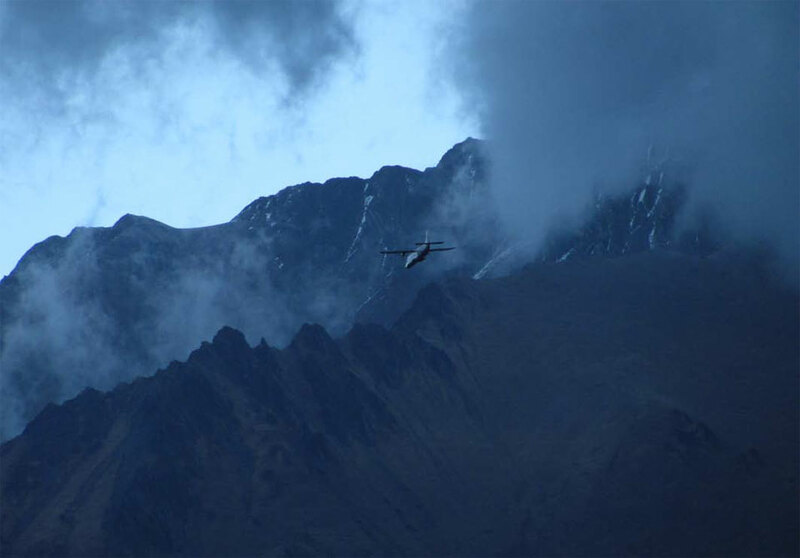 They had attempted an Everest mountain flight in the early morning but it was ‘no go’. 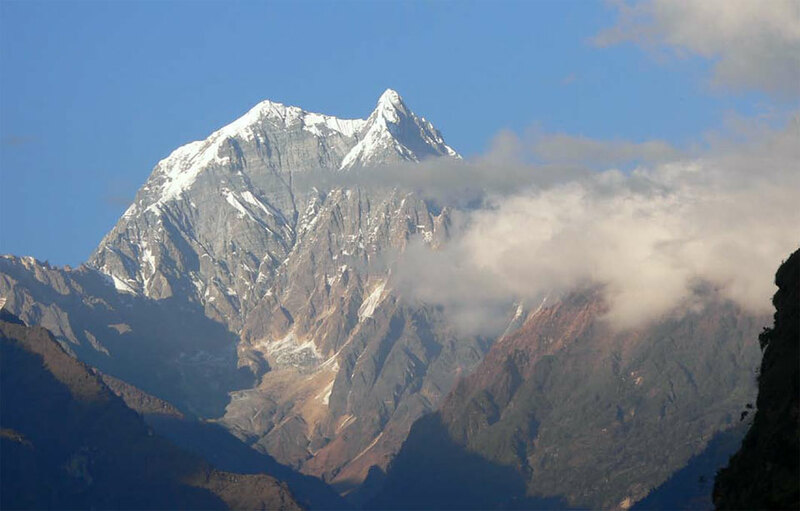 In Nepal it is inadvisable to fly in cloudy weather – their clouds have rocks in them! Neither of them was feeling on top of their game this morning so the trip wasn’t a complete success. Meanwhile, the rest of us visited the Bright Future Community Centre for a wonderful hour with the kids. One little boy’s solo rendition of Que Sera was rather touching. Some of us were a little choked up as we tried to join in the chorus. We hit Thamel for some last-minute shopping. The Weizen made us a good lunch and then we flitted from one shop to another picking up souvenirs. I really liked Helen’s big wall poster of the Annapurnas in twilight. Our usual prayer-flag shop was shut (it was Saturday) and the lassi shop too (a bit of a blow) so we jumped into two taxis and headed for home. Helen, Elizabeth and I had a great driver who passed almost everything else on the road and found some extremely creative short cuts. I later learned that the second taxi broke down not too far from home. Sorry you had to hike the last couple of kilometres when you thought the trekking was over. 5.30 saw yet another gathering of the clan for a walk to Bouda for dinner. Can’t think of a better place for a ‘last supper’ than the Garden Café. We did a lap of the stupa, which Gareth hadn’t yet seen, and then met Isabel and Netra at the café. We were soon joined by Dorje, Bir and Subash. It was a lovely meal. I distinctly remember doing the Hoki-Koki in a line across the deserted street on the way home. I had invited everyone down to the Muna Cottage for breakfast. The food is so much nicer down here. Dorje came with his wife Laki and his two boys Sonam and Lagpa. Gradually people left by taxi for their various flights. We rather wasted the rest of the day but I think that is just what we needed. Carol was shanghaied by Isabel to visit the ‘dog lady’. I organised a quiet daal bhat at home for the remaining guests – Helen, Carol and Elizabeth (who is ‘staying on’). Dorje, Bir and Subash joined us and the food was delicious. Thanks Muna. Netra and I took Carol and Helen out to the airport for their late night flight and that was that. I was a free woman! I wrote these final notes on 23rd November, having lost an entire day yesterday. I didn’t get up, I didn’t go out. It was great. I hope you all made it to your respective homes in one piece. (I know you did). I miss you all already. You were a great group. 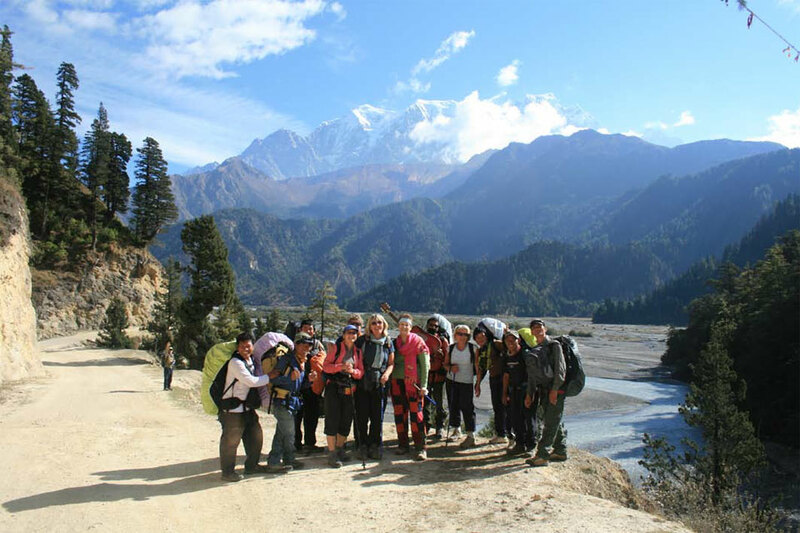 All these treks are lovely but each group brings its own special magic to the trip. I loved yours!